After the Battle of Britain had abated the bombing of the South Coast began the Luftwaffe making bombing raids on Dover and its harbour night and day. They not only crossed directly over from France, they also made sweeping raids along the coast bombing and hitting Dover with cannon fire, they also targeted Air fields such as Hawkinge, Manston and Biggin Hill. The Luftwaffe crossed the channel with as many as 300 planes in formation the sky was blackened by Luftwaffe bombers and the town of Dover would go dark. As the bombing continued a new threat came from the French coast towards the end of 1940 the German Army started installing their huge guns on the French coast that could fire shells across the channel, the first was the 38cm gun at SIEGFRIED BATTERY just south of Cape-Gris-Nez, followed by Three 30.5 cm guns at FRIED AUGUST BATTERY north of Boulogne, Four 28 cm guns at GROSSER KURFURST at Cape-Gris-Nez, Two 21 cm guns at PRINZ HEINRICH BATTERY just outside Calais, Two 21 cm guns at OLDENBURG BATTERY in Calais, Three 40.6 cm guns at LINDEMANN BATTERY between Calais and Cap-Blanc-Nez, Four 38 cm guns at TODT BATTERY outside Cap-Gris-Nez. These guns were later backed up by three K5 railway mounted guns which were also capable of firing shells not only across the channel but also at allied shipping in the channel At this time the British had little answer to this formidable fire power, a worried Winston Churchill came to Dover to see the situation for himself, he had already ordered the high ground either side of the port of Dover to be heavily fortified with large caliber guns. The only answer this British had to these guns at this time were the Royal Marine Siege Regiment at St Margaret’s Bay where they had two 14 inch guns nick named ‘Winnie & Pooh’ they had been fitted with 18 in turrets to increase the operating room. 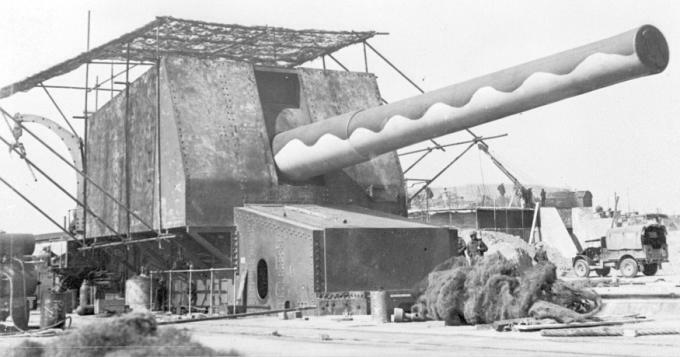 These guns were ineffective and slow and could never match the formidable firepower of the German guns. Winnie was the first gun to fire a shell that landed on main land Europe in August 1940, Winnie was joined later in the year by Pooh together they were used to bombard the long range guns on the French coast. These guns were manned by twenty five men of various ranks, there was also a separately manned firing control room, and they were protected against Luftwaffe low flying air attack by ‘Pom-Pom’ and ‘Ack Ack’ anti aircraft crews. Behind the guns were the shell and cordite magazines protected by layers of earth and heavily camouflage, each gun had a railway line running to it for delivery of the shells and cordite. Winnie and Pooh could not fire on German shipping in the channel as they were to slow and inaccurate, whilst the German K5 railway mounted guns were firing on British shipping in the channel with some degree of accuracy. Winston Churchill was incensed by this situation and ordered the building of new heavy gun batteries in Dover to stop German shipping moving up and down the English Channel so freely. Three 6-inch guns with a range of 25,000 yards were installed at Fan Bay Battery, Four 9.2-inch guns with a range of 31,000 yards at South Foreland Battery, Two 15-inch guns with a range of 42,000 yards at Wanstone Battery. In addition to these guns three railway 13.5-inch guns were added these were named Gladiator, Sceneshifter, and Piecemaker they were relics of WW1, the first of these to be used was Sceneshifter, when not in use it was hidden from the Luftwaffe in Guston railway tunnel hauled there by the Royal Engineers using diesel locomotives. This entry was posted in Artillery, British by MSW. Bookmark the permalink.